MWF, in coordination with several organizations, sent close to 13,000 gallons of potable water for the benefit of thousands of individuals and troop members who are currently affected by the crisis in Marawi. Among the beneficiaries of the water donation are members of the Special Action Force of the Philippine National Police who are also among the troops deployed in Marawi. Manila Water Foundation (MWF) continues to send water relief to thousands of families and military men affected by the ongoing crisis in Marawi City through its ‘Agapay Para Sa Barangay’ (APSB) program. Three months ago, when the armed crisis that displaced close to 360,000 individuals ignited, MWF immediately deployed more than 2,000 gallons of clean drinking water which benefitted families currently residing in evacuation centers in nearby cities and provinces. 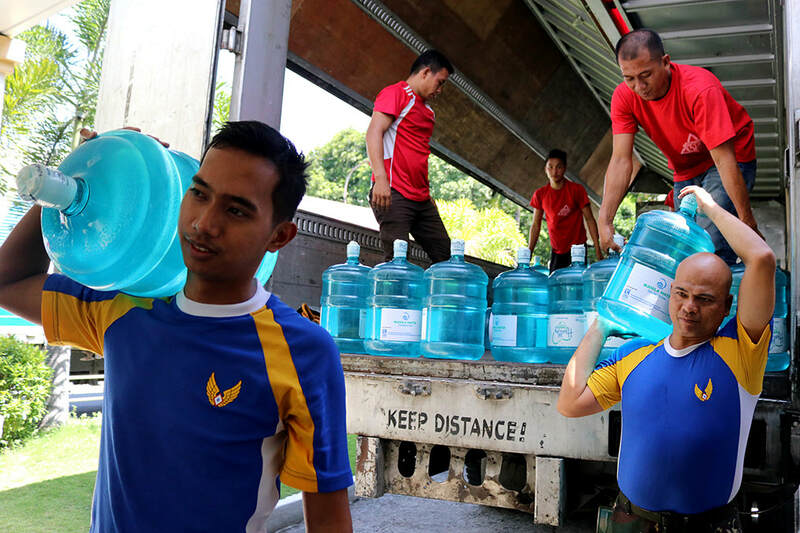 As a follow through, 12,300 units of 500ml bottles of potable water were also deployed for the sustenance of the members of the Special Action Force of the Philippine National Police and troops of the Armed Forces of the Philippines (AFP). ​The transport of the said donations was coursed through the office of the Civil Relations Service (CRS) of the AFP and Task Force Marawi which took care of the distribution of the potable water. According to Col. Noel Dela Cruz of CRS AFP (front, third from left) the water donation from MWF will help boost the morale of soldiers who tirelessly fight to bring back peace to Marawi. Joining him in this photo are members of CRS AFP and MWF Program Officer Franz Nikko Lacsina (front, rightmost). ​With this, Col. Noel Dela Cruz of CRS AFP shared his message of thanks while highlighting the importance of such donations. “Nagpapasalamat kami sa inyong suporta at sana patuloy nating suportahan ang ating kasundaluhan. Kung titingnan natin, parang simple lang pero iba ‘yung dating ‘pag nalalaman namin na may sumusuporta sa amin. Nakikita namin na ‘yung ginagawa namin ay na-appreciate at hindi nababale-wala. Malaking tulong ito para tumaas ang morale ng ating mga sundalo,” he shared. Soroptimist International of Congressional were among the partners of MWF who helped in the distribution of the water donations for the affected families in Marawi. ​In total, MWF has sent close to 13,000 gallons of drinking water which was made possible through tie-ups with several organizations including Manila Water Company, Ayala Corporation, Metropolitan Waterworks and Sewerage System, World Vision Philippines, Soroptimist International of Congressional, and De La Salle – College of St. Benilde. Through the shared concern for humanity and the extended support of these organizations, MWF was able to fulfill the logistical requirements of the APSB program, specifically the timely delivery and distribution of the said relief for affected communities in times of disaster. This said, MWF Executive Director Carla May Beriña-Kim expressed her gratitude towards these organizations while expounding on the mission of the program. “Like-minded organizations help us turn our mission of providing safe and clean water into a reality especially that this is among the first resources that gets compromised when crisis like this happens. Aside from making sure that the affected families will be free from waterborne diseases, we also want to uplift their spirits and spark hope as we usher them back to normalcy,” she shared. Through the APSB program, MWF hopes to continue its efforts of ensuring Marawi’s access to potable water. To know more about this program and for opportunities to help, visit ﻿﻿www.manilawaterfoundation.org﻿﻿.